Pope Francis is to launch Caritas Internationalis’ ‘Share the Journey’ migration campaign in Rome on Wednesday 27th September 2017. The two-year campaign of action and awareness-raising will promote the strengthening of relationships between migrants, refugees and communities. 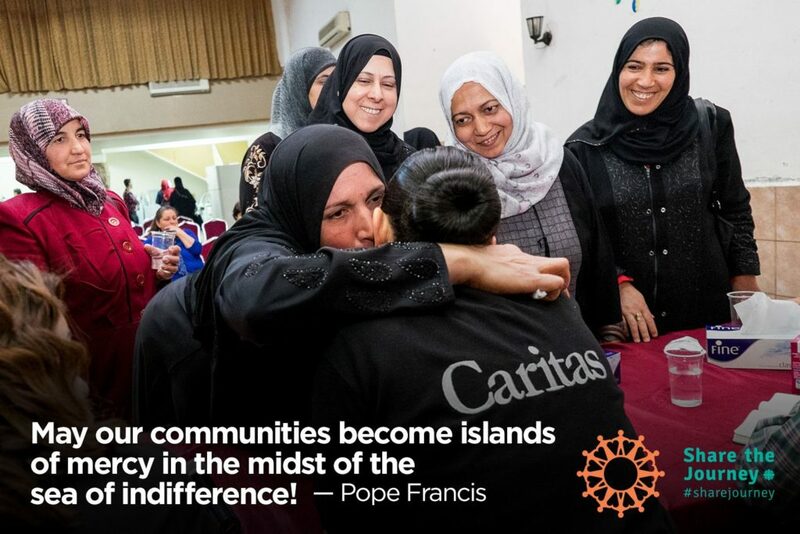 It is Caritas’ response to Pope Francis’ calls to promote the ‘culture of encounter’ – to see people on the move with humanity, to open hearts and minds, to change perceptions. Caritas Internationalis will shine light on the challenges and effects of migration at all points on the journey, while harnessing the strength of its more than 160 global members to campaign for a shift in thinking. The campaign will be bolstered by support from ACT Alliance, a network of 145 Christian agencies worldwide and a variety of other religious congregations and civil society groups. Cardinal Luis Antonio Tagle, President of Caritas Internationalis – the descendent of a child migrant himself, says, “Through ‘Share the Journey’ we’re making a simple suggestion to people: get in touch with a real migrant. Look them in the eyes, listen to why they left their homes, how their journey’s been, see the real people behind the numbers and scare stories. Caritas supporters will launch actions in their countries and communities around the world as part of ‘Share the Journey’. Awareness-raising will also focus on the two new Global Compacts on refugees and migration at the UN in September 2018. Caritas wants these two new international agreements to emphasise safe and legal migration and increase the protection of people on the move. Caritas Internationalis Secretary General Michel Roy believes change has to come – from individuals and governments. 12.30 pm CET, Vatican Press Office, Via della Conciliazione 54, Rome. Cardinal Luis Antonio Tagle, President of Caritas Internationalis and Archbishop of Manila. Bekele Moges, Director of Caritas Ethiopia. Sr Norma Pimentel, Director of Catholic Charities of the Rio Grande Valley on the USA-Mexico border. Oliviero Forti, Head of Migration, Caritas Italy.